I hope the holidays went well for everyone. It's sometimes difficult to be away from friends and family this time of year so I wanted to send each and every one of you a gift through the mail. And I found the perfect present, something distinctly Latin American that nobody would already have and you would never forget. Unfortunately, cooler heads prevailed and Tyler vetoed my idea of sending you each your very own dried Llama fetus. Battling with a little travel weariness, Tyler and I decided over a month ago that we were going to make a point to make this Holiday season special. But that´s easier said than done than when homeless and friendless in an exotic country, but we felt up to the task. 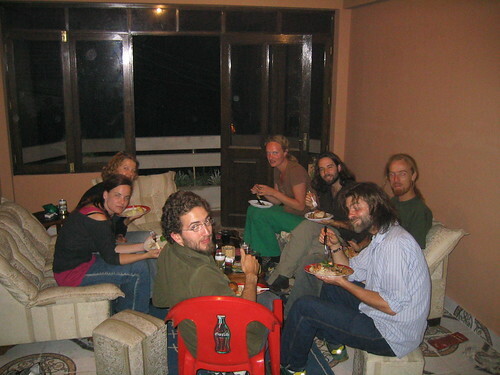 Tyler and I had met a scruffy englishmen named Ben way back when we were studying in Casa Rosario and he'd since moved to Bolivia to volunteer with a non-profit working on their food supply (amoung other things). So, shortly after Machu Pichu Tyler, Andy and I did our best imitations of Butch Cassidy & the Sundance kid and made a run for the Bolivian border. After one long night on the bus, we found ourselves in Copacabana on Lake Tittikaka, the highest navigable lake in the world. Tyler and sipped some of a goddawful tasting cactus tea and spent the day climbing mountains and walking along the coast. I had to keep reminding myself that I wasn´t gasping for air because of some scary adverse reaction to the tea but for the (only slightly more comforting) reason that we were so high up there IS no air. The weather that day was ideal, Tyler discovered that he is a rock (ask him to explain) and I had an adventure myself. The only person who didn´t have so much fun was Andy who had been feeling under the weather since Cusco and spent the day in bed. The next day, we woke up and took an overnight bus to wake up in the chaotic city of La Paz. We only had that day to walk around that city, but from what we gathered the entire city seemed to be a market. Everyone seemed to be adamantly and strenuously selling anything and everything you can imagine, including the Llama fetuses above, on every square inch of sidewalk. I used to think that the people in New York City were the most pushy salesmen, but La Paz raises the bar to a whole new level. 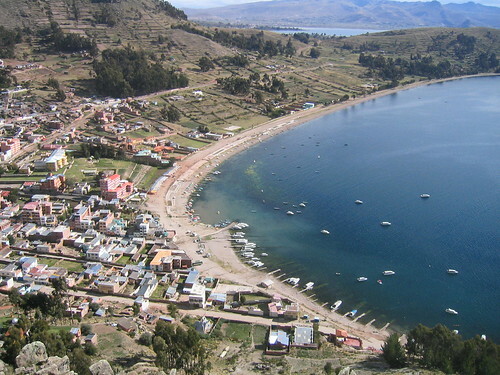 This is a city that convinced the whole world that the capital city of Bolivia is NOT Sucre, like it was established in the constitution, but La Paz (which annoys the folks from Sucre to no end). Until NYC has the president living in Manhattan instead of Washington DC I will consider them woefully outclassed. The next overnight bus took us to Cochabamba, ever closer to our Christmas in Sucre. As the holiday season went by I found I prefer the media culture down here to that at home in the US. There is much to love about the US in Christmas season, but the advertising for the consumer culture rachets up to a fever pitch starting the moment they take down Halloween decorations all the way through New Years. Here its more about family and friends because people don't have the same resources to consume as much so no one screams at them to Buy! Buy! Buy!. Well, I am embarassed to admit, almost no company here is that crass and materialistic. Coca-Cola has a long history of weilding the advertising savvy it learned in the media saturated US on populations that aren't accustomed to the barrage of ads that Americans see everyday. For example, while walking around Cochabamba we came across a huge "Christmas tree," in the center of town made out of 2L Coke bottles. Now I understand why, after watching people who can´t afford a meal drink soda by the liter, so many have so few teeth. But Cochabamba was only a stopover, and we quickly hopped on another bus to Villa Tunari. That tiny, remote, town buried deep in the jungle that we thought we'd escape the election chaos in. That wasn´t the only reason however, the biggest one was to visit the Inta Warri Yassi animal refuge. They have a constantly changing cast of volunteers who work to take care of formerly captive, or injured monkeys, birds, and pumas. In much of the world there are some (arguably pretty reasonable) regulations about how much education and experience one needs to, say, take a fully grown puma for a walk. Here in Bolivia, however, you only need to arrive and say you are willing to volunteer for a month+. We, sadly, didn´t have enough time to do anything but visit for a day but even that felt like climbing into the monkey cage in a zoo. 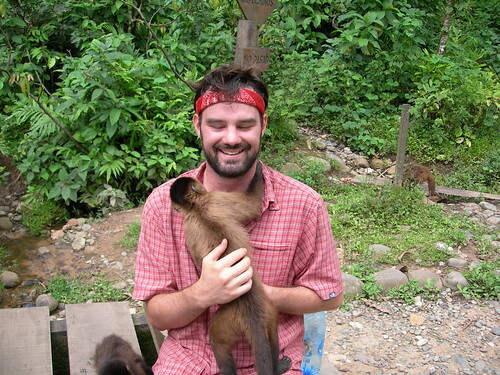 Within a minute of sitting down in their part of the park we had monkeys climbing all over us. We spent hours playing, tickling babies, and having our pockets thouroughly searched by nimble furry fingers. One day and one night bus later we finally arrived, with glee, to Sucre. Here we caught up with the legendary Ben Upchurch to show us around town. With a few days to prepare before Christmas we leapt into it. In addition to our "old" friends (Ben and Andy) we met a bunch of new friends at the hostel and invited them to celebrate with us at Bens apartment with us (poor bloke, he had no idea what he was in for). And then, to make this Bolivian Christmas one I'll be talking about for years, we went out and got ourselves a live somewhat bewildered turkey in a burlap bag. Thank God Ben had known what he was doing, and led as all through the process... from snapping its neck, to plucking, to gutting, to cooking. Although I eat meat when I'm travelling otherwise I've been a vegetarian for about 6 years now which made the turkey preparation a bit more difficult. Although it made me a bit woozy to see the turkey flop around and blink its eyes with it´s neck broken it somehow seems better to be a part of the whole process of killing, cooking, and eating. ...it was a Brilliant success!